Rocky Mountain Holidays have just posted all 2015 Rocky Mountaineer vacation packages for 2015. There are significantly more packages available with the welcomed addition of some old favourites such as the “at leisure” packages, which give you more time in the Canadian Rockies. There are now 129 Rocky Mountaineer Canadian vacation package options to choose from. For 2015, at time of press, all new Rocky Mountaineer Vacation packages will be subject to a 20% non-refundable deposit. In the past, guests took advantage of the low deposits to secure their vacations in advance. For now, any guests booking 2015 will have to be a little more committed – we always recommend you take out adequate travel insurance to protect you against unforeseen circumstances. It’s goodbye to NCL in 2015 and the relationship with Holland America continues to grow strong for the 2015 season. Having travelled onboard Holland America’s ms Zuiderdam myself out of Vancouver on their 7 night round-trip Alaska cruise, I have to say it was an excellent cruise ship and perfect for the Alaskan climate with not too much outside deck. In 2015, the ms Zuiderdam’s route will be replaced by the returning ms Noordam. The itinerary will remain the same. This ship is a Vista-class ship like the Zuiderdam and was the last built of the Vista Class ships (Zuiderdam being the first). As this is a newer ship, Holland America made some improvements. The consensus is that this is a better ship with some slight changes – it is a sister ship to ms Zuiderdam and has mostly identical features. So, this is a really positive change for the rail and cruise packages in 2015. We are already off to a great start! Here is a nice photo I took from onboard the ms Zuiderdam as we cruised Glacier Bay National Park – just breath taking. Photo taken from onboard Holland America’s Zuiderdam as we cruised Glacier Bay National Park, Alaska. The Zuiderdam is the sister cruise ship to ms Noordam. Holland America’s ms Westerdam will be the cruise ship of choice out of Seattle again in 2015 and ties in nicely with the Coastal Passage route which connects Seattle to Vancouver and the Canadian Rockies. So what new packages are available in 2015? Rocky Mountaineer’s research with guests and potential guests indicated that future guests are seeking more days onboard the train. To accommodate this growing demand for circle trips, Rocky Mountaineer introduced the new shorter-duration 6 night “Taste of the Rockies” Circle package. 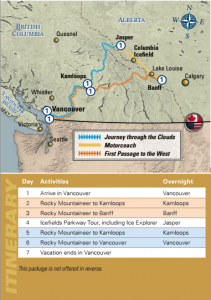 Itinerary and map of the new 2015 “Taste of the Rockies” Circle Vacation with Rocky Mountaineer. This rail vacation package includes both the Rocky Mountaineer’s best-selling First Passage to the West and Journey through the Clouds routes, plus a motorcoach tour along the Icefields Parkway connecting Banff and Jasper National Parks. The journey can also be extended to begin and/or end in Seattle instead of Vancouver by adding Coastal Passage, or combined with pre- or post-tour cruise options onboard the ms Noordam out of Vancouver. During my years of guiding in Banff National Park, the Icefields Parkway was one of my favourite places to take guests and the scenery never failed to disappoint. This route is only accessible by road and is a favourite of many Rocky Mountaineer guests too. With this in mind, the “Canadian Rockies Adventures” vacation package was introduced for 2015. It extends guests’ stays in Lake Louise and Banff to two nights, to allow for more time to include this spectacular highlight in their itineraries while at the same time, slowing the pace making this holiday more relaxing over 7 nights. Please note that this package is not the same as the one with the same name sold until 2012 as the old itinerary did not include lunch on the Icefields Parkway tour or the helicopter flight at Cline River. 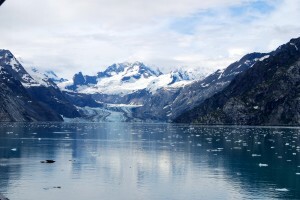 A 7 night round-trip Alaskan cruise out of Vancouver onboard ms Noordam can also be added before or after this package. Due to increased demand of vacation packages in the Canadian Rockies with longer durations, the “Canadian Rockies at Leisure” (9 nights) and “Northern Rockies at Leisure” (10 nights) have been re-introduced. These itineraries are very similar to the best selling Western Explorer package and the Northern Explorer package, but with two night stays in Banff and Lake Louise, as well as in Jasper. A 7-night round-trip Vancouver cruise onboard ms Noordaman can also be added to either of these packages (at the start or the end). We were some of the lucky ones to be invited onboard for the inaugural departure in August 2013 and we were certainly impressed by this new exciting route, connecting Seattle to Vancouver and the Canadian Rockies. 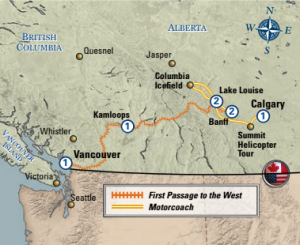 As in 2014, the Coastal Passage add-on is available to begin or end any Rocky Mountaineer package in Seattle, it can not be taken as a stand-alone. Is that all the changes for 2015? Yes, as far as we can see. Apart for some minor tweaks on some existing packages, such as the Summit Helicopter tour removal from the Canadian Rockies Getaway, Grand Rail Circle, Trans-Canada Rail Adventure, and Coast to Coast by Rail, no other major changes to report. We are delighted about the changes we have seen for the 2015 season…it will be here before we know it!